1. If elected, he will ask voters 6 months before the end of his first term for a vote of confidence. If he fails to get 50%+1, he will not run for re-election. 2. He will not serve more than 2 terms. 3. He will make no appointments to city council. All seats would be elected by the people. 4. He will have an open door policy. Yuri will be available at City Hall during normal business hours every Monday thru Thursday and alternating Fridays. If you want to talk to him, he will be available. 5. He will ensure City Council meets on the 1st and 3rd Tuesdays of every month, even if there is no business to conduct. This will still allow citizens to share their thoughts through regular public oral comments. Yuri and I covered many topics. He was particularly passionate on the Poway Road Corridor plan and the new Community/Senior Center. He thinks both projects are a waste of money, should be abandoned and the resources should be applied to other higher priorities, such as fire and police protection. Yuri does not want to make Poway Road look like Friars Road. We also covered his vision of transforming Stoneridge into a public golf course and entertainment venue for families. 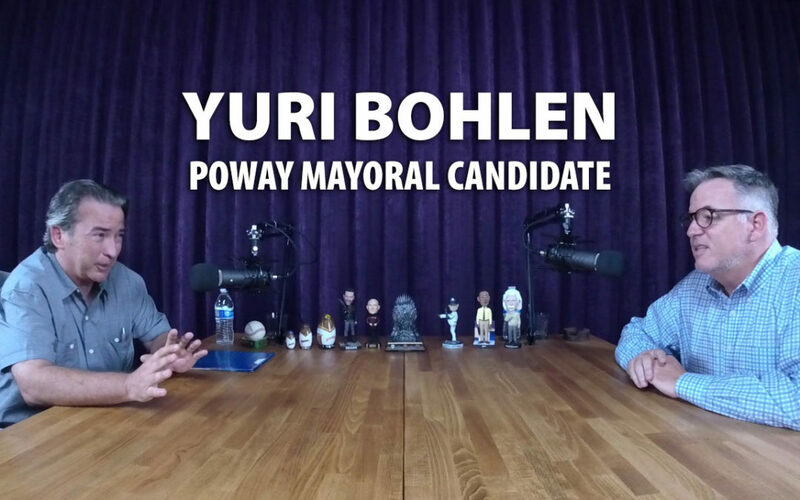 Yuri spoke at length about his concerns about the homeless in Poway and his objection to the appointment process for city council. He also shared his great story meeting Vince Neil from Motley Crue and his passion for both the San Diego Padres and the San Francisco Giants baseball teams. I will vote for anyone who will agree to put a stop to this new community/senior center. I untilize the senior center and have for many years. That building is plenty good for at least 25 more years. Stop what they are trying to do to the seniors of this city. You have my vote. Stop this new community/senior center building. The building serving as a senior center now would do so for another 25 years. Do not let them put the the seniors on the streets for 2 to 3 years unnecessarily. Thank you sir for your support. I sincerely appreciate it and please let others in the community know about me.